We spend more than half of our lives working and probably working in front of a computer. Chronic backaches, stiff joints and fatigue are common ailments we suffer from working long hours in front of the computer. Also, studies have shown that sitting for long hours is detrimental to your health. Siting for prolonged hours causes musculoskeletal disorders, spine deformity and impedes lung capacity. We can’t possibly change our work environment & lifestyle. So what other choice do we have? Finding a good office chair that can help negate the negative effects of prolonged sitting would be a good solution to our less than healthy lifestyle and work environment. But with so many options and conflicting reviews out there, how do we do about choosing the perfect office chair? Costs twice as much as the famous Aeron Chair, the Embody Chair is promoted as the first work chair design to create harmony between the body and computer. Designed by one of the original designers of the Aeron Chair, the Embody chair is designed for people who work in front of the computers all day. Presently, the Embody chair is the most ergonomic chair available in the market. The Embody chair focuses on ergonomic and was created to be structurally supportive while allowing the users to have a full range of movement. The complicated pixelated mesh is a result of 2 years of conceptualizing and refinement. Made up of 93 individual pixels, the pixels are independent of each other, however when put together, the seemingly thin mesh could afford the users a wide range of movements while consistently providing the desired support. Also, the Embody chair allows the users control over the tension and support level. Available in 15 shades, 2 frame colors, 3 finishes and 2 materials to choose from. Depending on your configuration, it could cost anywhere between USD900 to USD1,600. Balance material is made in Italy and consist of 100% polyester knit, the material in comparison with Rhythm is cushier and allows more air to flow through, probably more comfortable on comparison with the Rhythm. The Rhythm material is made in USA and consists of 100% polyester, however the material is stronger and probably less susceptible to wear and tear. Balance White is not covered under the warranty for discoloration. 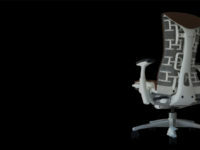 The Aeron Chair is recognised as one of the best office chair in the world and probably the most famous office chair. While the Embody seems underrated and the hefty price tag is a turn off but if one consider office chair as an investments and the associated health benefits that a good chair can bring. The investment is worth it. The Aeron chair is good but the Embody takes the meaning of ergonomic to another level and we think the price difference is justifiable.